Cool Find 1.17 is available now! 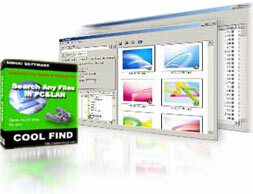 As a file search and management software for Windows, Cool Find endeavours to provide you a widest scope and a highest efficiency in file search and management. It is your best choice for desktop search. Supports Drag, Drop and Copy of files, even including those in compressed files. Support thumbnail view of HTML files and PowerPoint files in Win 2000 / XP.